With all the events taking place in Syria right now, many people are asking, "What does the Bible have to say about Syria and the end times? Is this the beginning of World War III and Armageddon?" Those are legitimate questions, but let me assure you, this is not the end. How can I be so sure? Because the Bible says Armageddon takes place at the end of the seven year Tribulation (Revelation 16:16), and the Tribulation has yet to begin. That said, I believe recent events in Syria have great significance when it comes to the study of bible prophecy. This doesn't mean you're guaranteed to see the immediate fulfillment of any specific bible prophecy. However, it does mean you should pay close attention. Why? Because, at the very least, these events are setting the table for the fulfillment of multiple bible prophecies. Just look around you. The signs of the Second Coming are everywhere. The restoration of Israel (Isaiah 11:12)... The Jews back in Jerusalem (Luke 21:24-28)... The Gospel preached to the world (Matthew 24:14)... An increase in travel and knowledge (Daniel 12:4)... The rise of the European Union (Daniel 2:43)... And many more. Jesus says once you see all these signs come together, His return is near (Luke 21:28). This means the Tribulation is close, and you should expect to see the fulfillment of many end times prophecies in the near future. Below are two prophetic events especially relevant to the ongoing events in Syria. The first could take place at any moment. I believe a careful study of the Bible reveals the second event will take place sometime after the war foretold in Psalm 83. Either way, both events could be very close to fulfillment. While both could still be several years away, breaking events could lead to their fulfillment in this very hour. Chapter 17 in the Book of Isaiah paints a sobering picture. In it, the city of Damascus is a pile of rubble. The Bible says it will disappear from the face of the earth and become a heap of ruins (Isaiah 17:1). At the same time, large parts of northern Israel will also lie in ruin (Isaiah 17:3). Now, before you say this prophecy was fulfilled during Old Testament times, keep this in mind... 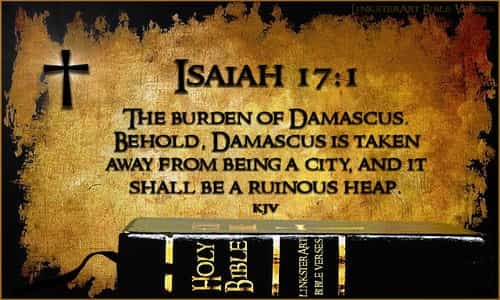 This passage says Damascus will cease to be a city (Isaiah 17:1). It will be utterly and completely destroyed. Yet, Damascus is one of the oldest continuously inhabited cities on record. Its history goes back more than 5,000 years. At 2,600 years old, the Book of Isaiah itself is new compared to Damascus! This prophecy is yet to be fulfilled. So how do current events in Syria relate to Isaiah 17? Following the U.S. strike on the Syrian Syrian chemical weapons facilities, a statement was issued by the Russian ambassador to the US saying: 'Again, we are being threatened. We warned that such actions will not be left without consequences." While this statement was clearly in response to a U.S. attack, Russia, Iran & Syria have made it clear they will respond to any nation they view as an aggressor. This includes Israel and makes a much more likely target than Syria or Russia retaliating direclty against the US. Hezbollah is part of the Iran/Syria/Russian alliance and would be more than glad to launch targeted attacks into Israel with backing from these nations. While it hasn't been a major news story, Israel has also been bombing Syria. They've attacked Hezbollah targets in Syria several times over the last year and last week bombed an airbase that resulted in several Iranian Republican Guard deaths, including a Colonel. Hassan Nasrallah, The leader of Lebanon’s Hezbollah terror group said the Israeli airstrike on an air base in central Syria that killed seven Iranians was a "historic mistake" that has brought Israel into direct conflict with Tehran. "This is unprecedented in seven years of war in Syria that Israel directly targets Iran’s Revolutionary Guard," Nasrallah said. Israel issued it's own threats in response, with senior Israeli security officials saying that if Iran strikes at Israel from Syrian territory, "Assad's regime and Assad himself will disappear from the map." They continued, "Our recommendation to Iran is that it does not try to act because Israel is determined to continue on this issue to the very end." If Syria and its allies view their situation as desperate, they may decide to use these bombing raids as an excuse to launch a chemical attack on Israel. This is because drawing Israel into the war could rally the Muslim world to Syria's side. Saddam Hussein tried this same tactic during the first Gulf War. In 1991, he fired Scud missiles at Israel in an effort to draw them into the war and break up the coalition aligned against him. While this is all speculation, and not necessary how Isaiah 17 will be fulfilled, it shows how realistic a near-term fulfillment of this prophecy could be. With current instability in the region, and so many warring factions in Syria, events could spiral out of control very quickly. At this point in time, it's not difficult to imagine a scenario in which Damascus is completely destroyed. Current events in Syria are also setting the stage for the Gog of Magog War. More than 2,600 years ago, the prophet Ezekiel warned of a future time when a vast coalition of nations will attack Israel. Ezekiel identifies these nations as "Magog, Rosh, Meschech, Tubal, Persia, Cush, Put, Gomer, and Beth-togarmah" (Ezekiel 38:1-6). These nations have since come to be known as the Gog of Magog alliance. Now, with the exception of Persia and Cush, I realize most people have never heard of these nations. But keep in mind Ezekiel used the names of these nations as they were known in his day. Each one is a clearly identifiable nation today. So who are these nations in our day and time? Collectively, these nations have never attacked Israel. In fact, in the history of the world, such an alliance of nations has never existed. But today we see it coming together right in front of us. Since 1989, Russia and Iran have gradually strengthened their diplomatic, military, and economic ties. Yet, in the first 2,600 years after Ezekiel recorded his prophecies, the nations of Russia and Persia (Iran) had never been part of any alliance of any sort. Never. Cooperation between Russia and Iran, especially military cooperation, didn't take place. This led many people to claim Ezekiel's prophecy was symbolic. Why? Because the idea of the Gog of Magog war seemed absurd. After all, at the dawn of the 20th Century, Russia was an orthodox Christian nation and Israel didn't exist! But those who believed in a literal interpretation of the Bible knew otherwise. They knew all prophecy would come to pass. Because bible prophecy doesn't come from mere humans. It's God's Word (2 Peter 1:19-21). In the years since, the stage has been set for the literal fulfillment of Ezekiel 38-39. A 1917 communist revolution transformed Russia from a Christian nation to an atheist nation. In 1948, Israel once again became a nation. And earlier this week, Russia and Iran issued a joint statement vowing to respond with force to any aggressor. And Turkey? For decades, people have wondered how Turkey could be a part of this alliance. After all, Turkey is a member of NATO. And in late 2015, Turkey shot down a Russian jet when it strayed into Turkish airspace. Russia and Turkey seem to be at odds. So how could Turkey be a part of this alliance? At first glance, it seems unlikely. But in the summer of 2016, Turkish President Recep Tayyip Erdogan jailed thousands of political opponents. And recently, Turkey voted to eliminate its parliamentary form of government and give expanded powers to Erdogan. Ultimately, this could be what pushes Turkey into the Russian sphere of influence. Erdogan is an anti-Western, pro-Islamist leader, and he's worked hard to strengthen Turkey's ties with Russia. He has had several heated exchanges with Israel's Netanyahu in the press and has shown support for the Hamas uprising along the border in Gaza. Turkey has clearly shifted from friend to foe over the past decade and presents a direct threat to Israel having one of the largest militaries in the region. In light of these developments, we can see the Gog of Magog alliance coming together for the first time in history. For the first time since Israel re-emerged on the world scene in May 1948, the main players of the Ezekiel 38-39 alliance are all working together. Even more important, they all have military personnel close to Israel's border. The stage is set for the fulfillment of Ezekiel 38-39. While terrible destruction awaits Damascus (Isaiah 17:1), northern Israel (Isaiah 17:3), and the entire Gog of Magog Alliance (Ezekiel 38:19-22), we have reason to be hopeful. Because of these events, the Bible says people will soon look to and acknowledge their Creator - the God of Abraham, Isaac, and Jacob (Isaiah 17:7). When He strikes down Israel's enemies, the whole world will know He is the God Israel (Ezekiel 38:23). In the days and weeks ahead, we can't be certain what will happen in Syria. But in the long run, we can be absolutely certain the events of Isaiah 17 and Ezekiel 38-39 will be fulfilled. Damascus will lie in ruin, and the Gog of Magog Alliance will be destroyed. These events are certain. Because whatever He has declared, God will bring to pass (Isaiah 14:24). And when these things happen, the world will no longer be able to deny Him. He will destroy the enemies of Israel in plain view of the entire world. Learn more about the converging of prophetic events at this unique time in history with our DVD - The Coming Convergence. Britt Gillette is author of the ebook Coming to Jesus as well as the books Signs of the Second Coming and Racing Toward Armageddon.